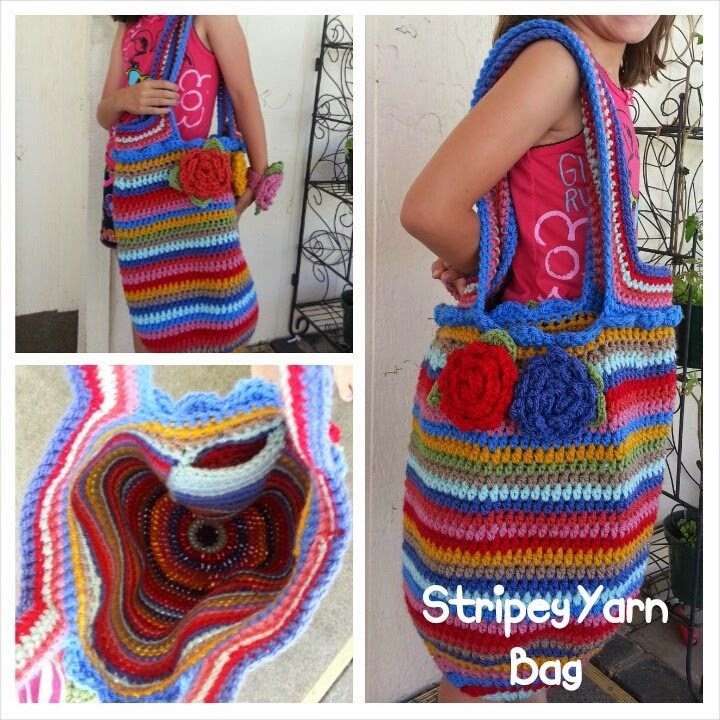 Tw-In Stitches: Stripey Yarn Bag for Me! I rarely make things for myself, but when one of my students gave me $48 to the Mary Maxim online store, I decided this was it! The moment I've been waiting for! I've been admiring Lucy's Jolly Chunky Bag for quite some time, and I knew I wanted to make it. So I used my $48 (a multiple of 16, since 16 is one of my favorite numbers) to buy some Titan yarn in six different colors of chunky happiness. I used Lucy's pattern for a bit, increasing until the ninth row. She uses double crochets in her pattern and when I hit the ninth row, I realized I wanted something tighter. 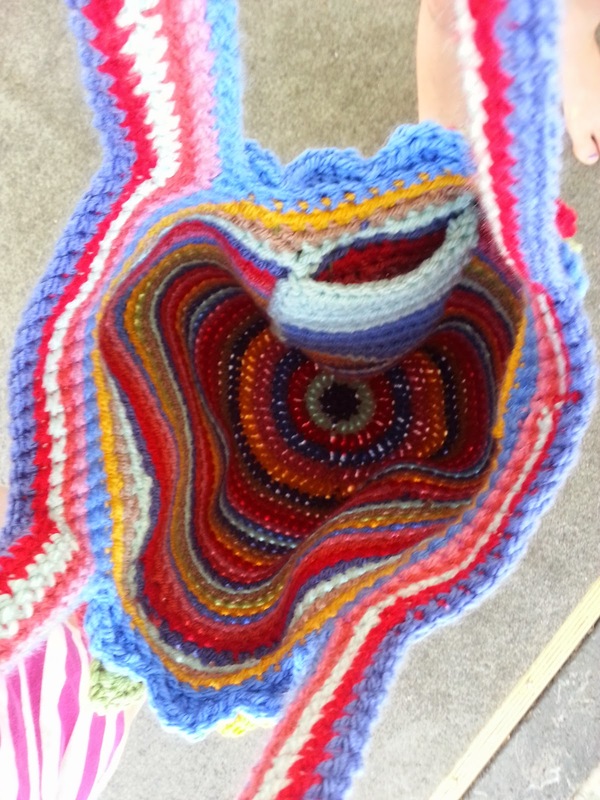 I switched to half double crochets for the sides of the bag. When I reached the top, I decided to the handles a little differently. 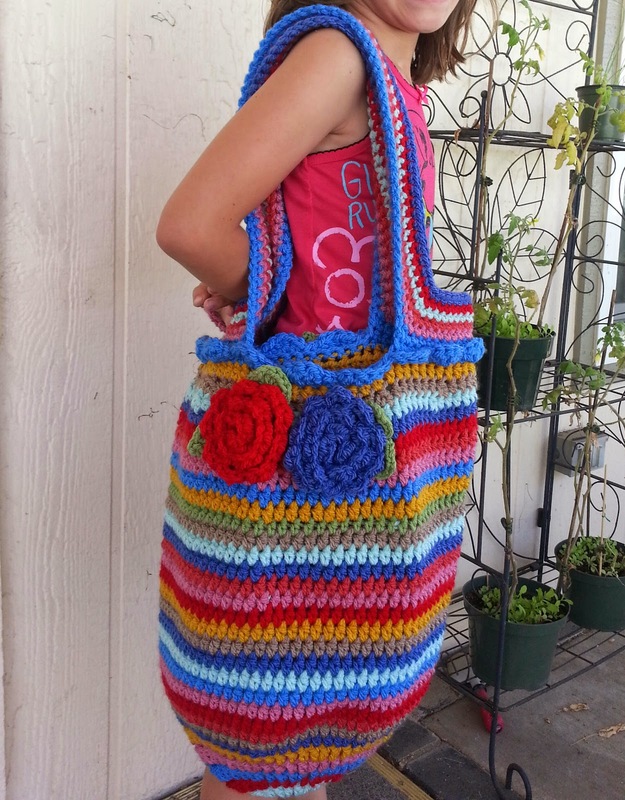 She crocheted the straps and sewed them on. I used a method I learned several years ago of making handles by creating chains and then single crocheting around to create the straps. I added some flowers from Cre8tion Crochet's flower clip pattern. I even made an inner pocket for my hook case.The pocket is just 10 or so rows of half double crochets made into a rectangle and carefully sewn in to that the stitches did not show through. I haven't lined it and I'm not sure I'm going to. This is really just for my yarn and WIPs. I love this yarn and if I had the money, I would buy it frequently. Who knew? I've never heard of Mary Maxim before I go this gift card. I may have to check them out more frequently.